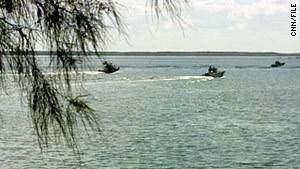 Officials search Falcon Lake, Texas, for the body of American David Hartley in 2010. (CNN) -- Twelve suspected members of the Zetas drug gang and a member of Mexico's Navy were killed in a shootout on an island in a lake that straddles the U.S.-Mexico border, authorities said Monday. Tiffany Hartley told police that she and her husband were riding water scooters on the lake on September 30 when they were attacked. Her husband's body has not been found, and the case has remained unsolved. "It didn't happen in the United States," said Zapata County, Texas, Sheriff Sigifredo Gonzalez. And Mexican authorities, he told CNN last month, have "somewhat of a zero solvency rate, and a zero conviction rate." "So unfortunately, this case may remain open forever, even though the information and the evidence may be there," according to Gonzalez.